I did a small investigation on which Hnefatafl rules are used in Russia, Russia being also part of the Viking world. "With the smaller board variants, pieces of either color may pass over the Throne; with the larger board variants, only the King may do so." "If the moved piece ends up sandwiching an opposing piece between itself and another piece of the moving color or a corner square, the sandwiched piece is removed from the board." "The Throne, corners and edges count as Black pieces for purposes of sandwiching the King, so Black needs only three pieces to capture the King on the edge of the board or if he is right beside his Throne, two if the King is right beside a corner square." "Variants. With the smaller boards, a different game is played if the pieces can only move one square at a time. With the larger boards, the King is allowed to escape by simply reaching any edge square rather than a corner square." Last Saturday I kept Steiger company and visited so called “hobby centre” named “Geek Wars”, where a hnefatafl (in Russian «тавлеи» - “tavlei” as you well know) training was provided by Dmitriy Pashkov who produces figures of vikings, board games and jewerly here in Moscow. Here are several photos, maybe some of them can be useful for your site’s gallery. “Tavlei” in modern Russian form is a variant played on a 9×9 board. Mostly the rules are the same as Saami tablut rules. However, in contrast to the historical rules the purpose of the king is to reach one of the four corners of the board. Moreover, the range of king’s movement is limited to three squares (sometimes the game is played without this rule, but as a default everybody uses it). No piece may land on the central square, not even the king (called in “tavlei” «князь» — “knyaz”, it means “grand prince” or “konung” in Russian) once he has left it (this rule for king is optional). By the way, the action figure of knyaz Sviatoslav Igorevich is used in Dmitriy’s tavlei set as the king, it looks very nice on the board. I’m a big fan of historical hnefatafl rules (especially in the form of my adorable Saami tablut) and in my opinion historical Saami tablut rules represent a very balanced game. Why it was necessary to upgrade them in that way - I don’t understand, but at the moment as far as I see these rules with corner escape are typically associated by many Russian people with a game of “tavlei”: there are a lot of 9×9 boards with corners (custom sets and commercial sets) and even smartphone applications. What is your opinion about the balance of this rules set? We think that the game seems to be unbalanced in favour of the attackers. Steiger even proposed to Dmitriy to make an attempt to win at least one game as defenders using these rules and won all the games as attackers, knyaz Sviatoslav was not able to leave the battlefield alive not even once unfortunately (just like the real knyaz Sviatoslav was attacked and slain by the Pechenegs). Have you ever tried to test such tafl variant on your site (any tournaments using similar rules) to find out if this variant can work well? enemy), but it can be captured in the next turn by the opponent without any movements just because it’s between two enemy pieces now. That’s an interesting modern concept but the main question is what does it mean for the game balance (especially with the corner escape)? day, playing face-to-face tafl games is always awesome. First to answer your questions. About the modern Russian Tavlei which you describe. We know and have tested this variant, we used the working title "Skalk Hnefatafl 9x9 (Expomedia)". Like you, we found that the game is playable but rather unbalanced in favour of the attackers. From 158 test games we found that the attackers win 17 times per 10 defenders' wins (balance -1.72). (In our test, the king can return to the throne, but that's not important to the balance). Limiting the king's moves will favour the attackers even more. Interesting with your ideas of dice and of capturing a piece which has stayed between two enemies for two turns. "If a player can move so that the enemy is between two of his pieces, it is killed and taken off, likewise the king." So an enemy move kills the piece. But even if your ideas were "local Moscow rules", no doubt there were also in ancient times sometimes local rules variations. What would it mean to the game balance? We haven't tried it, but my guess is that it does not change the balance significantly. When you move a piece between two enemies, the purpose is usually to do a double attack and not so much to park the piece there for several turns. And your opponent will usually react by immediately moving away one of the two attacked pieces. I have some questions, maybe you know something about it? Have you in Russia and in the Eastern area as a whole (the countries around the system of rivers which were travelling routes from the Baltic Sea to the Black Sea) in archaeological excavations found tafl (tavlei) boards and pieces? And what do they look like? Do you in the Eastern countries have historical sources which mention tavlei and give som hints about how it was played? Do you know the origin of the modern tavlei rules you mention in your mail? Perhaps they come from some books and articles in Russian/Ukrainian etc.? Perhaps they were brought home from some international viking exhibition fx. in Stockholm? Perhaps they were fetched from the internet, where the Expomedia site with these rules was extremely popular and all over the net many years ago. Thank you for this information. Our expectations are now confirmed. In “Obereg” the attackers are the “the Vikings”, the defenders are “the Varangians”, the king is “knyaz” (“prince”). The rules I’ve already described in my letter. It’s a complete mystery to me why these unbalanced rules are used for the game of tavlei with the utmost obstinacy, they are everywhere—in smartphone applications and in all possible game sets. Moreover, I witness with apprehension that this modern Slavophilic Varangian theory is being widely disseminated. About that idea of the new capture rule told us Dmitriy Pashkov as I wrote in my letter. I brought with me that evening not only my tablut boards but also the book of Damian Walker “Reconstructing Hnefatafl“ and printed list with four translations of Salmi, Ashton, Cartier and Troilius from this made by Aage page: http://aagenielsen.dk/tablut_translations.html. We told Dmitriy about the rule number nine and even about the rule number ten ( so-called “Linnaeian capture”). This new capture rule can be used near the throne and near the corners, so I feel like this rule helps attackers more and increases imbalance. Maybe if I have time I’ll keep looking. Under this title (“тавлеи”—“tavlei”, “тавля”—“tavlya”, sometimes in vernacular version “велеи”—“velei”) the game was named in Russian epics, songs and legends, where the Russian epic heroes were playing “German tavlei” (in Russia everything foreign was called German), and was prohibited by Russian orthodox church. In the aftermath of that the game was forgotten and the rules were lost. The word “tavleya” comes from the Greek language (“τάβλαις”) and means “board”. Also from the dictionary of the Constantinople Patriarch Photios it’s known that the word “tavleya” is the equivalent to the word “petteia” (“πεττείαις: παιδιαῖς τάβλαις”, “petteia: the game of tavleya”) which means the ancient Greek game. From petteia developed a Roman war game called “latrunculi” (“ludus latrunculorum”), from which in turn probably developed the game of hnefatafl. 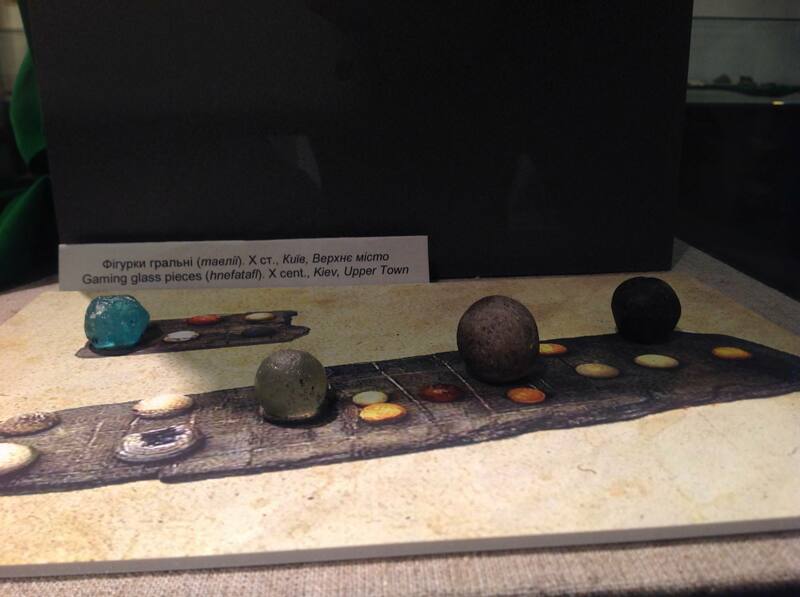 Thus, despite the fact that the nature of the game “tavlei” is unclear because of the loss of it’s rules, it may be probably assumed that this is an analogue of hnefatafl. But who can sure enough know, how deep all those ancient games were entwined? Maybe some of them represent different games. There are various arguments. By the way, mentioned above Vsevolod Merkulov is the one who suggests that hnefatafl = tavlei. Anyway nowadays tafl players in Russia call hnefatafl “tavlei”—“тавлеи”. Moreover, the word “tavlei” in the late Russian language means also a game of checkers (draughts). I don’t know any ancient sources with the tavlei rules. I think that all the rules used in Russia are taken and translated from the Western sources. And sometimes people create self-penned rules. Regarding tafl I know about Linnaeus diary and the Peniarth Manuscript written by Robert ap Ifan. There are mentions in sagas and in “The Senior Edda”. Regarding tavlei there are mentions in Russian epics sometimes with a very short and unclear description of gameplay. There is a mention in Сhurch Slavonic dictionary where the different types of gameplay are again short and unclear described and some of them are unlike hnefatafl. That’s all off the top of my head. Interesting that the creators of the “Obereg” game refer to the Linnaeus diary and say that “Obereg” rules are the result of the Linnaeus rules re-thinking. On their site there is the information that the head of the creative lab “2×2” and math teacher Anatoliy Bronnikov did the analysis of the Linnaeus rules and suggested several improvements that balance odds of the defenders and the attackers. As a result of his “improvements” we have these unbalanced tavlei rules. I just don't understand how a mathematician was able to change the rules in that way. Last edited by Ded Fomich on Sun Feb 11, 2018 8:31 pm, edited 2 times in total. Thank you, very interesting! Your post opens a door to a new universe - half of the world known to the vikings. "I'm often asked, where does this unusual game come from? Why doesn't anybody know this game? In the first place, the game is known by various names, Tavlei, Golden Tavlei, Tablut, Hnefatafl, Slavic Chess a.o. All these names are not very pleasant to the Russian ear of today and not easy to pronounce. Therefore Mihail Zadornov proposed to give the game a quite new name - Obereg." In the Obereg/Tavlei rules the king can return to the throne, and the rules are completely identical to the "Expomedia Tablut/Hnefatafl", which was linked to from everywhere on the internet at least since 1998. (Except for a very small detail; in the Expomedia, a defender is captured against the throne even when the king is at home, a rather inconvenient rule detail, I take it that it was rather a small programming error -). All the archaeological tafl boards I have seen, have no marking of corner squares. Indicating that the king at the time of the boards did not win in corners but on edge. The game board found in Staraya Ladoga is a bit unusual, in that there are no marked squares at all, not even a marking of the center square. Source of the Russian tavlei? It’s a complete mystery to me why these unbalanced rules are used for the game of tavlei with the utmost obstinacy, they are everywhere — in smartphone applications and in all possible game sets. "I would therefore like to take this opportunity to thank [5 collegues] for ... cheerful hours at the Hnefatafl board...The game 'Hnefatafl', which is discussed in the last chapter of the book, is in 1980 attempted reconstructed by David Brown, Oxford, with whose kind permission the game rules are printed - here, however, in adapted form. Testing the game has led to adjustment of the rules." (The "5 collegues" can explain why the rules come out so unbalanced - a few test games among 6 beginners is too little to determine if a tafl game works well). Some time during the years 1993-95 the Swedish company Expomedia implemented the Skalk rules as a computer game especially for use at historical exhibitions. They kept the Skalk rules but reduced the board to 9x9, which improved the game balance some. 1998 this version was all over the internet. And these Expomedia rules are exactly your Tavlei rules. By the way, your English is extremely efficient, my compliments. Probably noone in the tafl community here could've written a post like that in Russian! Exactly, the game was named by Zadornov. He was a Russian satirist, comic writer, actor and he also was a supporter of the Slavophilic theory, he was sharp criticized for that by the Russian science community. He promoted this theory in his shows and even made two films about Rurik and Prophetic Oleg, they both were strong criticized too. He died of cancer in November last year. We call it here in Russia “folk history” (or “pop history”, “pseudohistory” and so on)—historical conceptions introduced usually by nonprofessionals who ignore and/or deny fixed historical facts and build their own theory on this denying and/or ignoring. Actually the Norman question (Normanists versus anti-Normanists) was a highly politicised question from the very beginning and at present time in Russia the conflict rages on. Yes, there are no markings on that board. Maybe it was a game unlike hnefatafl. Maybe something else was used as a throne, a special piece for example. I use such throne piece on my tablut board. But that’s just my imagination. 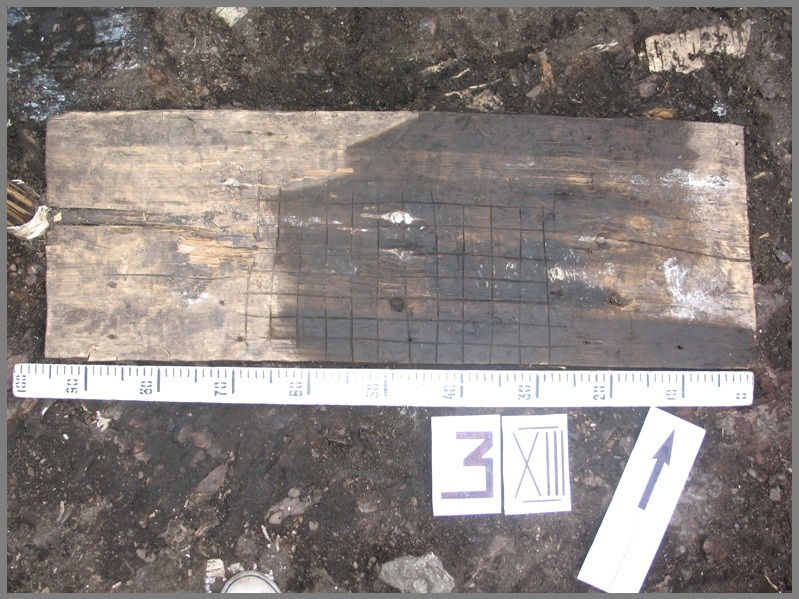 And the only archaeological boards with marked corner squares I know are the Brandubh boards. Could this be the path which led to the Russian Tavlei modern version? I think that this path looks very realistic. Computer games represent a very good tool to spread the word. I know also a computer game called “King’s Table: The Legend of Ragnarok” (Imagitec Design, Mirage Technologies, 1993), I heard about several Russians and I personally know at least one Ukrainian who learned hnefatafl due to this game. And somewhere in the comments to this game I saw a post of one Russian guy who wrote there about a hnefatafl game on the site of some Danish museum. That guy claimed that it was playable online. Maybe it was the game produced by ”ExpoMedia”? Or something based on it? Or he just mistook museum’s site for aagenielsen.dk? Thank you very much! I like foreign languages, typography, calligraphy. Of course, I will never speak and write like a native speaker or writer, but I always respectfully try to make as few mistakes as possible. Last edited by Ded Fomich on Sun Feb 11, 2018 10:09 pm, edited 1 time in total. The East Slavs were going hand in hand with the Vikings (the Varangians), the cultural penetration was very deep. The Varangian Rurik was invited by several rival tribes (not only Slavs) to stop infighting and put things right. By the way, Rurik, his brothers and his people arrived at Ladoga (Old Norse “Aldeigja”, “Aldeigjuborg”, modern Russian “Staraya Ladoga”), where the mentioned by me above board was found. Rurik was the prince of Novgorod (Old Norse “Holmgård”, “Holmgarðr”, modern Russian “Velikiy Novgorod”)—the city in the Ancient Rus’ (Old Norse “Garðar”, “Garðaríki”), he founded the Rurik dynasty, it ruled the Russians very long. And rulers of Kiev Askold (Old Norse “Haskuldr”, “ Höskuldr”) and Dir were members of Rurik’s armed forces. The first brother of Rurik Sineus (Old Norse “Signjótr”) ruled Beloozero, the second one Truvor (Old Norse “Þórvarðr”) ruled Izborsk. The Vikings used two main trade routes to sell in the South countries the looted in the North goods and captured slaves: the trade route from the Varangians to the Greeks and the Volga trade route. Also the Vikings often were recruited as mercenaries, the son of Rurik prince Igor recruited them, and the son of Igor Sviatoslav (his figure is used as the king piece in one of the modern tavlei game sets as I wrote in my letter) recruited them, and the son of Sviatoslav Vladimir did the same thing and so on ad infinitum (figuratively speaking). A brief summary of this post: scratch a Russian and you will find a Viking! I think that they just had no need to travel so far. They probably were reasonably prudent people, so they had no reason to discover new wild and perhaps not mastered territories, they already had a lot of opportunities. They could settle down in the land of big rich cities (in Rus’ or in Byzantium, for example), they could be willingly recruited by many rich lords who waged numerous internecine wars, they had great opportunities for pillaging, plundering, capturing slaves and trading. In short, they were very busy and, so to say, very happy in already discovered eastern and southern lands. The conquest of Siberia and the Far East was much later than that period named the Viking Age, that conquest was made by the Cossacks who actually were for some time brigands and pirates like the Vikings.